Mae'r eglwys yn adeilad hudolus ac hanesyddol a chroesawn bawb i ymuno a ni yn ein gwasanaethau dwyieithog, neu i ymweld a'r adeilad hardd. Our well loved church, dedicated to St. Michael and All Angels has a wealth of history and we welcome friends and visitors to visit or to join us in our bilingual worship. Services are held at 10-30a.m. on the 1st and 2nd Sunday, of each month. Eglwys Newydd, also affectionately and more usually known as Hafod Church, is situated in a quiet and picturesque area, on the boundary of the Hafod Estate. 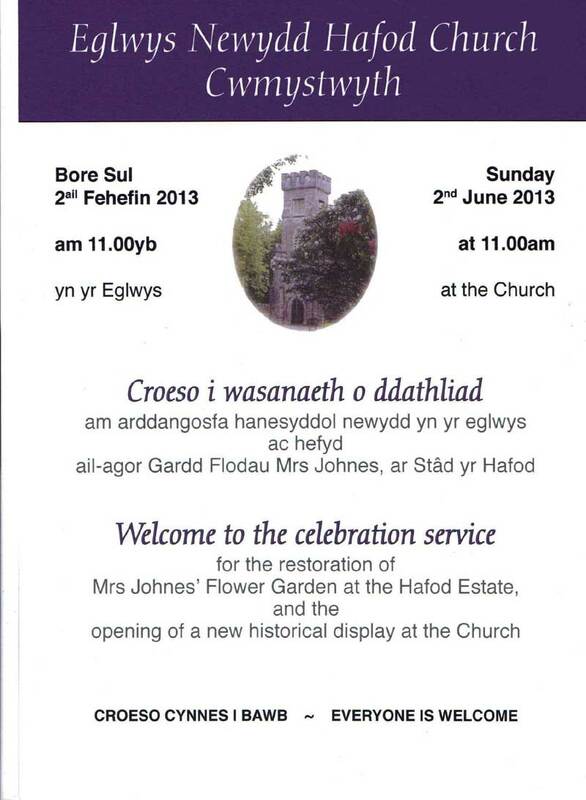 The first church at Hafod was built in 1620 by Morgan Herbert, one of the early Squires of the Hafod Estate. Thomas Johnes inherited the Hafod Estate in the late C18th' and established himself as a pioneer in new forestry and farming methods - his picturesque estate had become an essential destination for early visitors. He built himself a beautiful new mansion designed by Thomas Baldwin of Bath, and also wished for a more elegant church. ln 1803 he commissioned James Wyatt to design an impressive new church. Wyatt was best known as the restorer of Salisbury Cathedral and some extravagantly Gothic country houses. There are some unusual features to this beautiful Gothic church in that the "east" window in fact faces south-west. The font, made of Coade Stone, is decorated with carved roses, the Johnes coat of Arms and figures representing the cardinal virtues. One window contained sixteenth century Flemish stained glass brought over from the Low Countries by Thomas Johnes, during the French Revolution. lt was indeed an outstanding Gothic building. The outward appearance of the church has not changed very much but unfortunately the roof and the internal Gothic furniture, fittings and paintings were lost or badly damaged by a fire in the church, in April, 1932. The font survived amidst the charred fallen roof timbers, but tragically the beautiful marble memorial, sculpted by Sir Francis Chantrey in memory of Mariamne, the only child of Thomas Johnes, was damaged beyond repair. 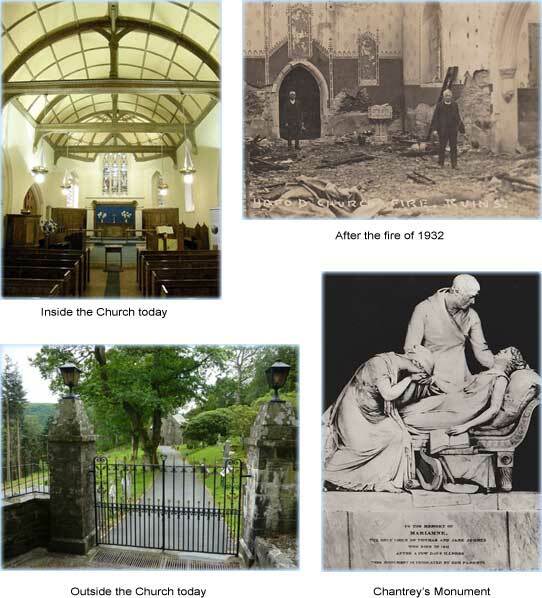 After the fire the excellent work of restoring the church on this occasion was overseen by W.D. Caroe. He designed the present attractive limed-oak roof, furnishings and fittings. Fragments of the Flemish stained glass window were salvaged and fitted into the chancel windows. The church building has again recently undergone extensive sensitive refurbishment, and the heating and lighting have been renewed. This beautiful church has a wealth of history and is again looking particularly fresh and welcoming. Much social history has been researched by Mr Edgar Morgan and members of the church. A touch screen computerised kiosk in the church now enables visitor to seek their family history and easily locate the grave stones and information about their loved ones. 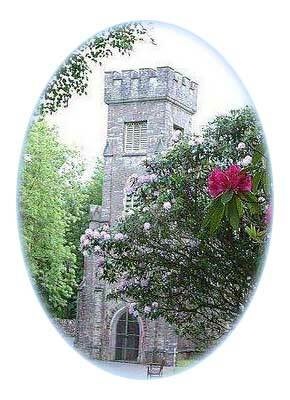 The spectacular and picturesque setting of the church and the internal beauty make it an excellent venue for weddings. The church is open to the public every day between 10-00am and 4-30pm from Easter to the end of September.